Register for the 2012 Assets Learning Conference—And Get Special RuFES Registration Discount! It’s that time again… Assets Learning time! Every two years, CFED hosts an Assets Learning Conference (ALC), which is THE EVENT to be at if you care about advancing family economic success! It brings you together with more than 1,000 participants from community groups, nonprofits, foundations, businesses, financial and educational institutions and government to learn how others across the country are helping low-income families and communities build assets and financial success. With four full-day conference institutes that go deep on special asset-building topics, four plenary sessions and over forty concurrent sessions focused on specific asset-building innovations and stories, the conference covers a wide range of topics that can help you strengthen your work to produce more and better results for rural families. Even better, we are working with CFED to RuFESize the ALC, by adding several rural-focused sessions and perspectives to the agenda. AND the RuFES Action Network will be hosting a Peer Gathering on the first evening of the conference (September 19) — an opportunity to meet fellow Action Network members, share some meaty RuFES content, and enjoy light refreshments as we connect more RuFES dots. 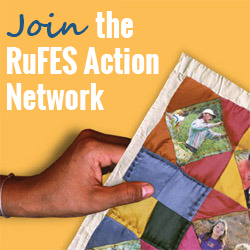 Register Now and Get the RuFES Action Network Discount! In recognition of the unique and critical perspective offered by RuFES Action Network members to the ALC, if you decide to attend the conference, you can receive a discount if you register with a RuFES code. Ordinarily the full conference fee is $700 ($600 if you register by the July 13th early bird deadline). However, with the RuFES discount, the registration fee for the ALC is $500. If you and/or your colleagues are interested in registering for this year’s conference, please contact us and we will send you specific instructions about how to register with the discount. To read more about the 2012 ALC, please visit the conference website. To check in on the agenda as it develops, check out CFED’s blog. Note: CFED is still finalizing significant portions of the agenda, including several rural sessions, and they likely will not show up on the website until after August 15.